There are about ten Samsung devices that showed up on an Indian import and export database that will be making their way through the country. Included in the database is a Samsung Galaxy S5 with a 2K display: the Samsung SM-G906S and Samsung SM-G906K. These are expected to be the “premium versions” of the Galaxy S5 that have been circulating on the internet. The other devices include the Samsung SM-G310HN, which is part of Samsung's ACE line of phones. The Samsung SM-V700 is Samsung's smartwatch, the Galaxy Gear. The Samsung SM-G313F is on the list and not much is known about it but it's supposed to be a smartphone. 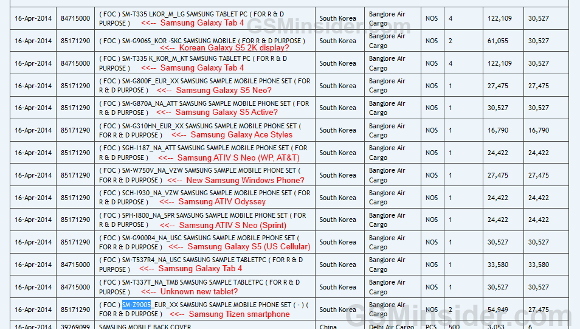 There's also a crop of already released devices on the list: The Samsung SM-T335 (Galaxy Tab 4), SM-G310HN (Galaxy Ace Styles), SGH-l187 (Ativ S Neo), SCH-I930 (ATIV Odyssey), Samsung SPH-I800 (ATIV S Neo), Samsung SM-G900R4 (GS5 US Cellular), amongst many others. If you check out the database, the list is pretty self-explanatory. Some of the devices on the list aren't even released yet and Samsung hasn't made an official comment on the phones, tablets, and gear that'll be arriving in the region to be tested. samsung galaxy gear only for 1300rs? wtf! :-D is this a joke?